4 1910-40's era & 1 RPPC Noel Missouri MO Postcards Really Clean! 5 1930-40's & 1 Chrome Rolla Missouri MO Postcards Really Clean! 5 1910-20's era Lebanon Missouri MO U.S. Highway Postcards Really Clean! 2 1930's-40's era Tiptonville & Portageville Missouri MO Postcards Really Clean! Details about 3 1910 era & 4 1930's-40's era Trenton Missouri MO Postcards Really Clean! 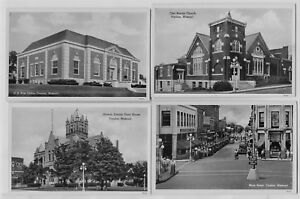 3 1910 era & 4 1930's-40's era Trenton Missouri MO Postcards Really Clean!